Gotta admit - I love interior decorating. And a inner-city tiny flat needs lots of organisation and clever storage! What's your favourite place in Sydney to buy those home essentials like storage boxes, hanging rails (renter-friendly is a bonus! ), and maybe a cute towel or rug to pretty up your pad? 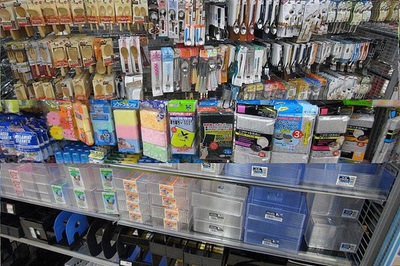 Howard's Storage World and Officeworks are both great for organisational bits and pieces. But if you're after something with a bit more design to it I'd try Daiso at the Mandarin Centre in Chatswood. It's a Japanese store, and everything is only $2.80 which is an absolute steal. They have a lot of cute things - even their rubbish bins come in sweet patterns! Howards storage is brilliant for all your storage needs. They have storage tools that you didn't even know existed! Ikea is another great place if your looking for reasonably priced interior decorations (I always like the photoframes and cushions). They also have great shelving and other storage tools. Brilliant question. There are many people doing great guns with small spaces in Sydney. For storage, apart from the hallway cupboard I like the storage baskets from IKEA. Officeworks was also a godsend with moving house. Bunnings Warehouse has a huge range, and at great prices. And they're scattered all around Sydney which is convenient. You can get all those things and more at Peters of Kensington too - and for kitchen storage ideas I love Victoria's Basement (both stores have central CBD/Inner West locations or online options). Howards Storage also has to get a mention - they solved our latest two storage needs beautifully (an indoor clothes horse and laundry basket). Another great cheap option is always to do things like re-use milk crates or old pieces of plywood for shelves, re-purpose food containers and decorate things you would otherwise say goodbye to. It all depends how talented at DIY you are though - I'm not but really love and admire the efforts other people put into this. I'm making do with a few items from Ikea and Officeworks and a bit of DIY until Muji comes to Sydney next year.